As well as giving me plenty to write about, the conference also provided me with the means to feed marypcb's growing MiniSharpie addiction, as well as delivering one of the better conference bags in a long while - a rather tasteful grey canvas shoulder bag that reminded me of the old military knapsacks the cool kids always had at school. Then it was back to the UK, where I'm catching up on all the writing that needs to be done before Christmas. 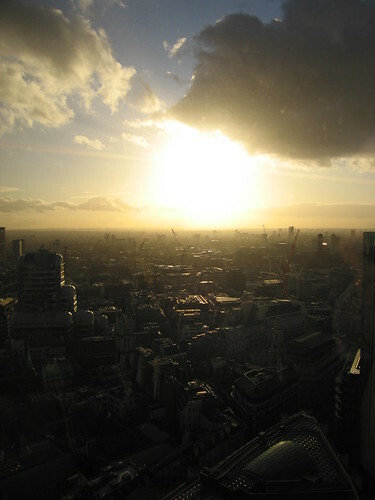 I did manage a lunch meeting up on the 24th floor of the old NatWest Tower (now renamed Tower 42), where I watched the low winter sun cast its light across the city, highlighting the edges of the roofs, the towers and the cranes. As always I had a camera with me. Hell, that looks like a film poster: amazing shot. The cranes make the photograph look surreal. What stevegreen said! Very Blade Runner. Could be steampunk as well. Beautiful in any historical or pseudo-historical period. What a beautiful photograph of city and sky.